I remember about 10 years ago in Perth, there was a franchise business called Make Your Own … salads and sandwiches. I don’t remember the full name – something makes me want to say Mr Bird’s Make Your Own …. But I don’t even know if that is right. I just know MYO. There were all the rage at the time. I remember them in Perth and I remember them in Sydney. But you know what? I don’t recall seeing them for a very, very long time. Wonder what happened to them? Anyway, we found Sashimi salmon in a Korean grocery store in New Malden on the weekend. I was so excited. I have not found sashimi seafood sold in the mainstream stores over here (so far), and there’s not a specialist fishmonger in Richmond. …Actually, I lie. There’s a seafood restaurant in Richmond called FishWorks, that also sells seafood but it is mighty expensive. 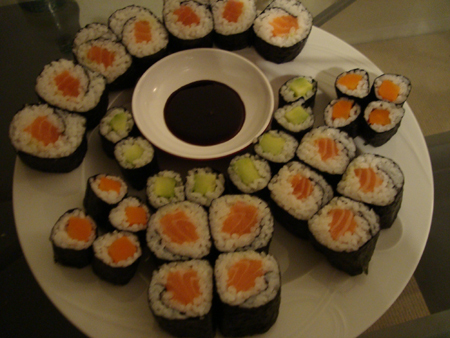 I really miss the ease with which we were able to buy sashimi anything in Sydney and make our own sushi. Only salmon was available but it was better than nothing. Make next time, we’ll find sashimi tuna and seaweed and we’ll be set! Our platter completely fails the prettiness and display factor, but it tasted yummy all the same.